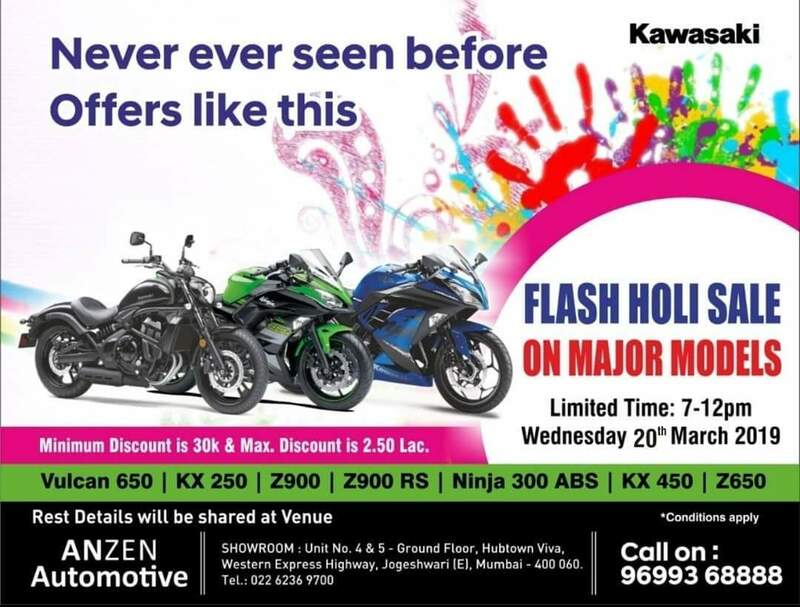 India Kawasaki Motors' Mumbai dealership, Anzen Kawasaki, has announced a flash sale on select motorcycles. The flash sale would take place on the auspicious occasion of Holi – 20 March, from 7 p.m. to 12 a.m. Do note that this is a dealership level offer. Anzen Kawasaki will hold a flash sale on select motorcycles on the auspicious occasion of Holi on March 20. Buyers can get discounts in the range of INR 30,000 to INR 2,50,000. India Kawasaki Motors’ most affordable product, the Ninja 300 ABS is also covered under the offer. The motorcycle retails at an ex-showroom price tag of INR 2.98 lakh. Heavily localisation of the Ninja 300 resulted in a price cut of INR 62,000 over its predecessor. Considering the minimum discount announced by the dealership, the ex-showroom price of the Ninja 300 ABS (dual-channel as standard) could come down to INR 2.68 lakh. There are no changes to the mechanical specifications of the locally assembled Ninja 300. The 296 cc liquid-cooled, parallel twin cylinder, DOHC, 8-valve engine delivers 39 PS of maximum power at 11,000 rpm and 27 Nm of peak torque at 10,000 rpm. The motor is connected to a 6-speed gearbox and features assist & slipper clutch. Considering the minimum discount announced by the dealership, the Ninja 300 would be available at INR 2.68 lakh as against its actual price tag of INR 2.98 lakh. Meanwhile, India Kawasaki Motors is offering special offers under which buyers can opt for a 0% Rate of Interest or a Gift Voucher.